The May 13th - 21st GRC Update! Two weekends ago the O'Haras usurped the Reichs title as "Most Valuable GRC Couple of the Week" with incredibly strong performances at the Delaware Running Festival. Dave got the win in a solo 1:15:14 while second place trailed behind by over 6 minutes! Laura ran 3:18:31 in the full. Laura was 4th, and she was also solo for huge portions of the race, so much so that she described it as surreal. Not bad at all for her first marathon in 7 years! At the Swarthmore Last Chance meet Jesse ran her first open 800 in over a year, clocking in at 2:11.84! Also at Swat, Stewart ran 14:41 for the 5k and Liz 4:50 for the 1500. Over in France, Emily D ran 16:29 for 5k at the Meeting Fungana in Cergy, France. This puts Emily at Third on the GRC all-time list! This most recent weekend, GRC had a stellar showing at the Brooklyn half marathon. Both Kerry and Balmer boasted PR's of over 1:30! Kerry in 1:17.45 and Balmer in 1:09.17. Not to mention that Balmer tuned up for Brooklyn by winning the Capital Challenge on Wednesday in 15:23 for 3 miles. Also at the Capital Challenge, new GRC superstar Abbie Atwood was second in 17:55. Last but not least, Emily D ran a new club record of 9:32.1 in the 3000 at a small meet in Paris. Emily is in great shape, and she's going to get a chance to prove it this weekend at an invitational meet in Belgium, where she's running the steeple. Brace yourselves for this marathon of a blog post! The long awaited results are in, folks! Jerry impatiently checking his watch, wondering how much longer he has to wait to learn the results of the Pittsburgh Marathon! Maura C ran her marathon debut in 2:54! "It was a great marathon debut for Maura, who ran almost exactly even pace"
It has been 6 months of hard training for Maura since transitioning to the marathon. The GRC family is very proud of Maura and so thrilled to see all her hard work come together for her debut. Back in the City of Brotherly Love, a handful of GRCers battled it out against the wind at the Broad Street run. Despite less than ideal conditions, Ben Franklin and the Quaker spirit helped all three GRC ladies along to PR's with outstanding results on the men's side as well. Kyle can hardly contain his pride for the GRC ladies and their slew of PR's this weekend! The Reichs decided to celebrate their friday night PR's with a well-earned lazy sunday. Lazy sunday in the Reich household entails sleeping in past 5 AM and participating in the Frederick Half Marathon. Naturally, Steph was the first woman to cross the finish line and second finisher overall, breaking the tape in 1:16:15. Sorry Hannah, we couldn't let this accomplishment go unnoticed! Your ever-growing fan base would be more than disappointed. Hannah Rowe spent a lovely weekend in Vermont centered around her induction into the Vermont High School Sports Hall of Fame. Her resume shined even among the impressive cast of Lakers players, Red Sox draftees, and lifelong coaches. In fact she was the youngest inductee, having been chosen during the very first year in which she was eligible. Admiring supporters from all aspects of her life were in attendance, and she delivered a powerful speech about how their support and advice allowed her to be so successful. Special thanks to Phill and Bekele for tipping us off to Hannah's big accomplishment! Friday night at the Kehoe Twilight meet was a fantastic showing for the GRC gang. The Reichs both set PR's in the 1500 with Steph running 4:27 and Stewart running 3:56. This was a big break through for Steph, as she had previously never broken 4:31. 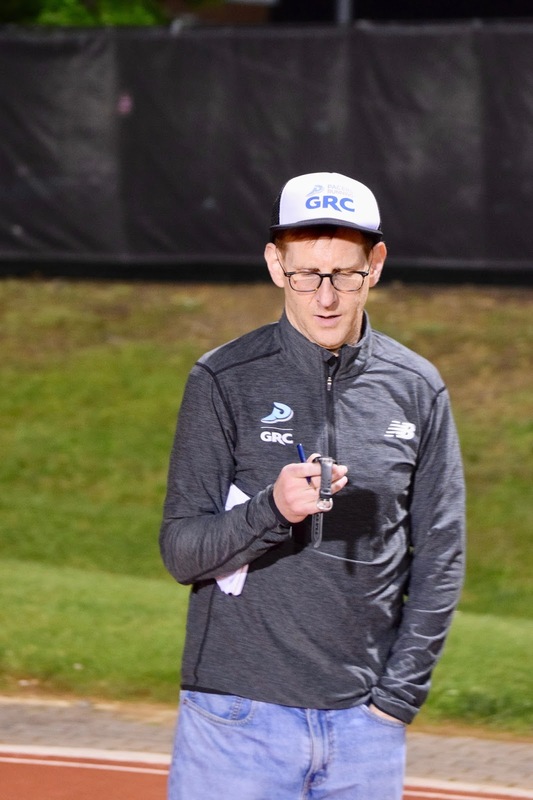 GRC handily swept both titles in the 5k with Elena winning the women's race in 17:04 and Kyle running 15:15, with strategic pacing assistance from both the Reichs. Stay tuned for photos from friday's races as well as reporting on one of the year's most highly anticipated marathons -- and I am not talking about the attempt to break 2:00!